Collaborative conversations with Life's wise whispers in service to personal and communal evolution. To book personal appointments and group experiences, contact me at circleways.james@gmail.com or at (416) 966 – 2685. Last night, I offered a teleseminar through the Gaian Tarot Circle entitled “Leaving the Stories That Bind Us”. Based on work I’ve done with several clients and with myself, I created a six-card tarot layout for us to use. I offer it below for your own growth and evolution. This spread is especially helpful for those issues and circumstances that we encounter over and over again. Its intention is to excavate an old story that we carry around unconsciously and keep living out in the recurring situations in our lives. Place the name of your issue in the blank space in question One. And now, the layout itself. Use it with tarot, crone stones, soul cards, or whatever tool is you primary vehicle of insight. May it liberate you from whatever story has been holding you back! What is the root story underlying __________? What is that story inviting me to learn? What is my next step toward integrating this learning? What resources support this next step? What obstacles could block this next step? What gift(s) can emerge from taking this step and employing these supportive resources? DO NOT SPEAK UNLESS YOU CAN IMPROVE UPON THE SILENCE. Whatever its origins, this is such a gem of wisdom. When I sit with people in a PeerSpirit circle, I do my best to remember that I have two ears and only one mouth as we engage in conversation that’s as attentive, intentional, and conscious as possible. When offering a tarot counselling session, some of the most powerful insights have arrived when I’ve simply allowed a client to spend time with a tarot image without us saying a word about it. Unnecessary verbal filler in either case would be ruinous. In these times, we’re so accustomed to our empty moments filled with background music, chatter, and perpetual commentary that the soul retreats way into the background. We barely get something out of our mouths than two or three other people are vying for airtime. The voice of the inner teacher, and even the voice of the inner demon, get squashed. We need to hear these. Both of them, along with every other aspect of self, are esteemed members of our personal council, each with something to offer. We need refreshment. Moments of silence, whether one minute or one week in length, are restorative and allow who we really are to bloom. To listen to Life’s wise whispers in the treetops, in the caress of rock and stream, in the whir of the red-winged blackbird takes us to a state that’s deep and real. Aahh…presence. Yes, that’s it. Silence and listening equal presence. What a tremendous gift in a whirlabout culture. From the Wild Unknown Tarot, I drew a card to respond to, “What is silence?” and got Trump II, the High Priestess. Silence is the animal self awaiting a vision. Silence is the ultimate spiritual practice. Silence is a living dream. Silence is the reflection of the night. Silence is that which transforms predators into priestesses. Silence is the moon gazing at a tiger gazing at a crystal ball. I don’t believe in a stove, I cook with it. I don’t believe in a computer, I communicate with it. I don’t believe in a potato, I eat it. I don’t believe in a hammer, I use it to put a nail in the wall. The tarot isn’t a deity or a creed, it’s simply a tool. However we use it is up to us. I employ it for personal insight (for self and others), community-building games, as a prompt for journal writing, as a focus for meditation, as a creative springboard for poems, as a business brainstorming tool, as a visual “post it note” to motivate me toward my goals, and so much more. Tarot, like many other things in my life, is about practice or usage, not belief. 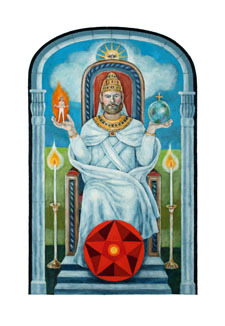 Image: The Hierophant from The Jungian Tarot by Robert Wang. 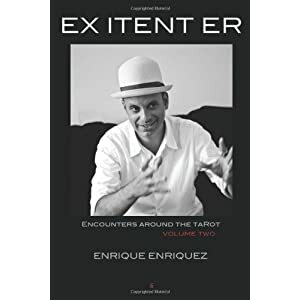 EN TEREX IT: Encounters Around the Tarot, Volume One, and EX ITENT ER: Encounters Around the Tarot, Volume Two. Where else except in this rich collection of interviews with 47 people can one meet architects, dancers, tarot consultants, ritual magicians, mentalists, historians, psychics, novelists, mystics, professors, journalists, fortunetellers, psychotherapists, scientists, and graphic designers in one place? Each interviewee has or had some form of experience with the tarot. What promises are in magic that technology cannot fulfill? How do you think all will end? Shouldn’t we put the tarot on parole, and keep it away from bad company? How many mandorlas do you have in your life? What is the role of tarot readers in Western comtemporary society? Are we evolving? Should we? How can one be a trickster without being a charlatan? The true encounter with an image begins, and perhaps ends, with silence. I think reading Tarot is very much like singing: everyone can sing and most people are pretty awful. We seek to share with others an interaction with the symbols that is beautiful and alive. To be honest, I wish there were fewer readers. For a craftsman/artist, the more you make beauty, the more your soul is beautiful. Spending luxurious, contemplative time with the symbols and characters of the tarot would be enough to change us from the inside out. One subject struck me as trying too hard to be clever and another mentioned his book at least twice on every page. Fortunately, the other forty-five interviewees were less self-absorbed and engaged my attention from beginning to end. The tarot attracts one heck of a fascinating cross-section of people. What excites me about this collection of conversations is that one can absorb so much about life and how one might live it. The diversity of perspectives is refreshing; the books end up being a sort of council where many voices and philosophies sit side by side and offer what they’ve learned so far. Both the tarot and life are celebrated as works of art, as poetic acts that carry the potential to make a difference to individuals and to our culture. Perhaps the message of these two books (it’s helpful to get the pair) is best conveyed in Enriquez’s own words: “I think about the cards and that makes my life better, not because any message or meaning the cards may have, but because the beauty of the visual connections I draw between them is uplifting.” After reading these two books, I felt as though my creativity had been stimulated and that I had been changed for the better somehow. I highly recommed both EN TEREX IT and EX ITENT ER to anyone who wants to enrich not only hir understanding of what the tarot can be, but also what life can be. You can purchase both books on Amazon and through the publisher, EyeCorner Press. Today, January 6, is the festival of the Epiphany in many christian traditions, a celebration that’s older than what we now have as Christmas. “Epiphany” means “revelation”, “striking appearance”, or “manifestation”. This inspires me to come to Life with questions based on this theme and to allow the tarot to respond to them. What wants or needs to be revealed to us at this time? XV, the Devil, reversed. Collective unconscious shadow material that contributes to our self-limiting feelings and behaviour. How can we best pay attention to it? 10 of Pentacles, reversed. Take a break from self-destructive urges; put self-abuse on pause; look before leaping into commitments that could be traps. In what life-sustaining way(s) can we employ this revelation? Ace of Swords, upright. Initiate a dialogue with the shadow (in the journal? with a therapist/guide? in a circle of trusted peers? other? ); consciously stimulate conversations about shadow and limitations with one another; begin fresh, conscious lifestyles. Demon est Deus inversus (the devil is god upside-down). The devil is merely the divine as seen by the unwise/uninitiated. These inspire a fourth question: What divine gifts can be brought forth through the revelation of and dialogue with the shadow? XVIIII, the Sun, reversed. Our bright shadow (previously hidden “gold”/treasure); revitalisation of the human spirit; an epiphany of humanity’s True Core Self. Several packs of cards came into my life in 2012 and I would like to take a moment to celebrate them and share their names and their creators’ names with you. Some of them I’ve used with clients and in workshops, others I’ve used only for my own insight. I hope that at least one of them speaks to you. To be fair, I list them in alphabetical order. Dodal Tarot de Marseille (restored by the late Jean-Claude Flornoy). Both the full deck and the majors-only version. Tarot of the Holy Light (Christine Payne-Towler and Michael Dowers). Joan Charles Tarot (Joan Charles). Mysterium Tarot deck and book set (J. Jordan Hoggard). Noblet Tarot de Marseille (restored by the late Jean-Claude Flornoy). Tarot of the Spirit, new version (Pamela Eakins and Joyce Eakins). Triomphes de Paris (Bertrand Saint-Guillain). Viéville Tarot Majors (restored by Roxanne Flornoy and the late Jean-Claude Flornoy). Wild Unknown Tarot (Kim Krans). Arathusa Oracle Cards (David Rankine). French Cartomancy Deck (published by Lo Scarabeo). Lenormand Revolution (Carrie Paris and Roz Foster). The Magician from the Mary-El Tarot by Marie White; Le Bateleur from the Dodal Tarot restored by Jean-Claude Flornoy; The Rider from the Lenormand Revolution deck by Carrie Paris and Roz Foster. In the name of my soul and in the power of my full radiant personhood, I call on 2013 to be a partner with me in tangible prosperity, excellent health, vibrant creativity, aligned connections/networks, purposeful contribution to our world, and a rich destiny. 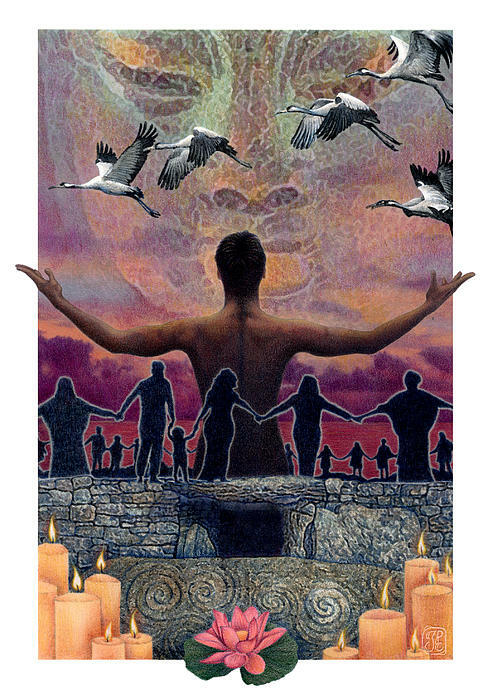 * Image of the Awakening card is from the Gaian Tarot by Joanna Powell Colbert.